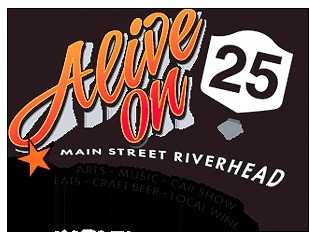 Subject: LongIsland.com - Your Name sent you Event details of "Alive On 25- Riverhead"
Alive on 25 is a free summer street festival in Downtown Riverhead offering local craft beverages and wine, live music, artists, street vendors and plenty of activities for all. Main Street closes to traffic to allow a walkable pop-up musical festival and restaurant offerings, artist exhibitions, and family friendly activities. Alive on 25 hosts a popular classic car show for all to enjoy. The festival starts at 5PM and ends around 9:30 PM. On July 5th we will host fireworks for an Independence Celebration. Our rain date is Aug 23, please check the website and Facebook to see if we are holding an event that night.